Every thought Roger Sullivan has about his late daughter, Joy, is colored by two things: the gift that she was to all who knew her, and that he lost her in a tragic car accident just before she was to attend LSU. From the moment they lost Joy, the family has tried to only let positive things be generated from the person she was and their memories of her. Roger first fell in love with LSU as a boy scout, when his troop served as ushers in Tiger Stadium. A pastor by trade, he converted his wife (a Southeastern alumna) into a Tiger fan, and raised his three daughters in purple and gold. 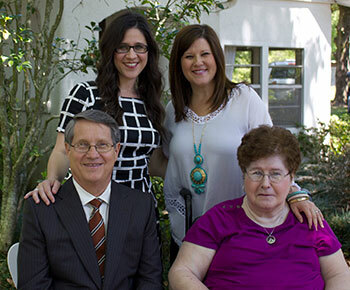 Their eldest daughter, Leslie, is now a doctor at LSU’s Student Health Center, and their second daughter, Ashley, is an LSU alumna. “So, when it came to Joy, there was no other place,” Roger explained, adding that Joy eagerly anticipated her turn to become a Tiger. Roger shared that he was unable to help pay for Ashley’s LSU education as much as he would have liked, and he never had the opportunity to pay for Joy’s. As a result, he feels like he owes it to his daughters and his parents, who funded his schooling, to help others. The family is in the process of endowing the Joy Louise Sullivan Memorial Travel Abroad Scholarship in the College of Humanities & Social Sciences. The award will help fund travel abroad for two students each year.